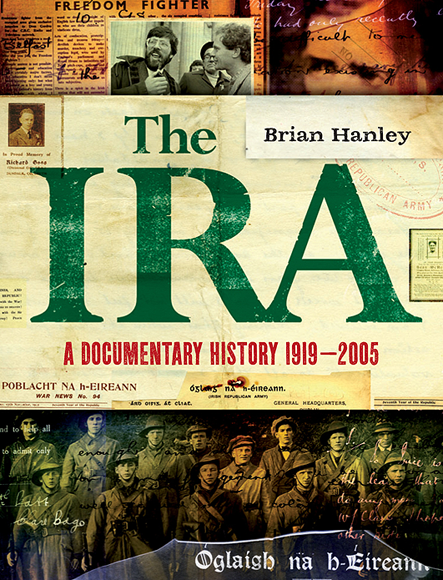 The IRA: A Documentary History 1916 – 2005 is the latest offering from Dr. Brian Hanley author of “The IRA 1926-36” and co-author of The Lost Revolution: The Story of the Official IRA and the Workers Party with Scott Millar. This book provides a politically balanced, clear, succinct and very well written account of the IRA in all its different guises and incarnations from the founding of its forerunner, the Irish Volunteers, in 1913 to the post Good Friday period. The book narrates the history of militant Irish Republicanism in the 20th Century using IRA internal documents, propaganda publications, posters and newspapers, many of which are previously unpublished. These give the reader an insight into the IRA’s motivation, internal divisions and self image through the decades. The author states in the foreword that the book “…is not a definitive history of the IRA, nor a complete study of it in any era” However this book serves as an excellent “pocket” or “concise history”. It is a brilliant introduction to the novice and a great reference book, further educating and enlightening those already familiar with the subject. The book is divided into seven chapters detailing: the early Irish Volunteer movement, Easter Rising and War of Independence – The Civil War – The IRA in the late 1920’s to early 30’s and its relationship with Fianna Fail – the 1939-40 bombing campaign and the IRA during the second World War – the 1950’s border campaign – The early Northern “Troubles” and the Official / Provisional split – and a final chapter detailing the 1980’s hunger strike and the modern Peace Process. readers interest and attention. In the first chapter dealing with the origins of the IRA, the Easter Rising and War of Independence Hanley also provides brief histories of the other militant Republican organisations that existed at the same time; Na Fianna, Cumann Na mBann and the Irish Citizen Army. Whilst most historians tend to rely on the Bureau Of Military History, Mulcahy Papers and autobiographies of IRA veterans to study this period, Hanley utilises the lesser known collections from the National Library, the IRA’s internal newspaper An t-Oglach and the Humphreys papers in the UCD Archives. The chapter on the Civil War has some particularly interesting information about the role of the remnants of Connolly’s Irish Citizen Army, the IRA’s report on the death of Michael Collins at Beal Na mBlath and Liam Lynch’s changing attitudes toward the “Rules of War”. Hanley’s chapter on the 1930’s details the emergence of Fianna Fail, the IRA’s relationship with Clan Na Gael in the United States , the Soviet Union and Indian Nationalists. The chapter also notes the IRA’s appeal to Northern Protestants in July 1932 and the emergence of the Republican Congress. Hanley’s account of the IRA’s contact with Nazi Germany during the Second World War and the internal divisions amongst the republican internees in the Curragh during the 1940’s will give the reader food for thought as the IRA’s role in this period is often oversimplified. Hanley draws the reader’s attention to the serious internal strife within republicanism at the time caused by Sean Russell’s military plans and strategies. This included Tom Barry’s decision to leave the organisation and the leadership of Cumann Na mBann’s letter of protest to the IRA expressing their disapproval of the bombing campaign and their concern at IRA contacts with Germany. The author also has to be credited for his decision to devote a whole chapter to the IRA’s “Border Campaign” in the 1950’s. Hanley highlights in his foreword that this period is not very well-known aspect of the IRA’s history – “For a great many people the IRA disappears in 1923 and remerges in 1969” As well as being illustrated by documents, newspapers and propaganda leaflets the book is frequently illustrated with photographs. Chapter six on the beginning of the Northern “Troubles” has some particularly good photographs of Liam Mc Millian, Seamus Costello and Gerry Adams. In the final chapters of the book Hanley is not afraid to raise and address controversial issues linked to modern politics. These including the question of Fianna Fail’s support for republican paramilitaries in the 1970’s, Richard O Rawe’s claims about Sinn Fein’s role in the 1981 hunger strike and the Provisional IRA’s attempts to cover up its responsibility for the Enniskillen Bombing in 1987. Overall the book is very well written, brilliantly illustrated and beautifully laid out. At Euro 24.99 the book is very reasonably priced and good value for money. This book is a must for anyone interested in modern Irish history or politics. Written by: PadraigOgORuairc on 3 November, 2010. Last revised by: Eoinpurcell19 April, 2011. 5 Responses to "Book Review: The IRA, A Documentary History 1916-2005"